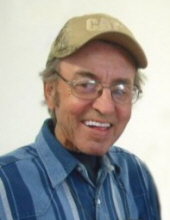 James “Jim” Russell Fried, age 73, of Mapleton, Iowa, passed away on Tuesday, January 22, 2019, at his residence of Mapleton, Iowa. A Memorial Service will be held at 2:00 p.m., Saturday, February 9, 2019, at the Armstrong – Van Houten Funeral Home of Mapleton, Iowa. Rev. Jena Finch-Manchester will officiate. A Visitation will be held one hour prior to the service from 1:00 p.m. to 2:00 p.m., Saturday, February 9, 2019, at the Armstrong – Van Houten Funeral Home of Mapleton, Iowa. Committal will be held at a later date. The Armstrong - Van Houten Funeral Home of Mapleton, Iowa is in charge of the funeral arrangements. Condolences may be sent online www.armstrongfuneral.com. James “Jim” Russell Fried, the son of James R. “Shortie” and Mary (Harris) Fried, was born January 20, 1946, in Mapleton, IA. He grew up in Mapleton and received his education from Mapleton High School graduating with the class of 1964. After high school, Jim entered the workforce as a heavy equipment operator. He lived most of his life in Mapleton except for a few years in Tennessee and Mississippi. On February 14, 1965, Jim was united in marriage to Diana Jacobs in Mapleton, IA. To this union two sons were born, Michael and Todd. The couple would later part ways. On September 1, 1988, Jim married Dianne Hollander and welcomed her children Elizabeth “Liz”, Kelly, Torey and Todd, to their blended family. In his free time, Jim could be found tinkering in his garage building things. He also enjoyed taking Dianne out for Sunday Fun Days in the dune buggy he built and going on Poker Runs. Left to cherish his memory include his wife Dianne Fried of Mapleton, IA; children Michael (Gena) Fried of Lakeville, MN, Todd (Paula) Fried of Arthur, IA, Elizabeth “Liz” Nielsen of Okoboji, IA, Kelly Samuelson of Mapleton, IA, Torey (Shannon) Martin of Manson, IA and Todd (Carmen) Martin of Danbury, IA; numerous grandchildren and great-grandchildren; numerous nieces, nephews, extended family and friends. He was preceded in death by his parents James R. and Mary Fried; brother Victor Fried; sisters Mary Beth (Gailen) Weller and Elvie (Bill) Parker-Sanford. "Email Address" would like to share the life celebration of James "Jim" Russell Fried. Click on the "link" to go to share a favorite memory or leave a condolence message for the family.